Following yesterday’s logo launch, the Western Bulldogs will formally transition its apparel brand from KooGa to BLK ahead of the 2015 season. Owned by the WRS Group, BLK is the internationally recognised high performance sports apparel brand, and consolidated KooGa as part of its international expansion in November 2013. PRE-ORDER NOW: View and pre-purchase the 2015 BLK Official Western Bulldogs Apparel range. The Western Bulldogs became KooGa’s first AFL team in Oct 2009 and will continue its partnership with WRS Group and the BLK brand until at least the end of 2016. Western Bulldogs Chief Executive, Simon Garlick said the WRS Group had played an integral part in supplying high-quality performance apparel to its players and staff. “KooGa has been a valued partner of ours for the past five years and we are looking forward to having BLK appear on all our new apparel,” Garlick said. BLK Chief Executive Officer Tyron Brant said he was thrilled the Western Bulldogs have transitioned from KooGa, to coincide with its recent logo launch. 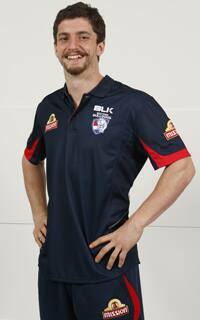 “We are very pleased to have the Western Bulldogs continue with the WRS Group and join the BLK family,” Brant said. Members and fans wanting to be the first to wear the new BLK range, which will feature on both the AFL and VFL team apparel, can click here to pre-order 2015 gear today.